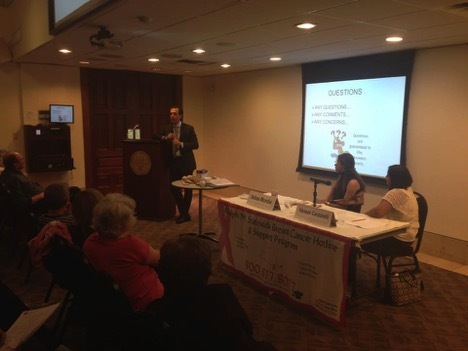 Dr. David Light was a guest speaker at the Adelphi NY Statewide Breast Cancer Program’s Living with Lymphedema Forum where he gave a presentation entitled “Surgical Treatment of Lymphedema: Am I a Candidate?” to a group of about 100 women. The forum provided information on lymphedema for those who have had breast cancer, including early identification and the potential for developing lymphedema when recovering from breast cancer surgery. Dr. Light’s presentation provided a review of surgical techniques to treat lymphedema, such as Vascularized Lymph Node Transfers (VLNT), patient candidacy, and recent scientific studies supporting the use of lymph node transfers in the treatment of lymphedema. On the panel, he joined a physical therapist specializing in lymphedema and breast cancer therapy and a bilateral mastectomy and DIEP flap reconstruction patient who developed lymphedema four months after her surgery. Generally accepted as being incurable and just manageable with therapy, Dr. Light is one of a few surgeons in the United States who is using VLNT to improve lymphedema. This microsurgical procedure takes healthy lymph nodes and their attached blood vessels from one area of the body and relocates them to the swollen limb allowing the excess fluid to properly drain into the lymphatic system again. Several scientific studies have demonstrated promising results using VLNT to relieve the severity of lymphedema. Attendees were excited to hear about these microsurgical advances as lymph node transfers potentially give patients a long-term solution to a painful condition. People suffering with lymphedema can consult their physician to determine if they are candidates for this procedure.